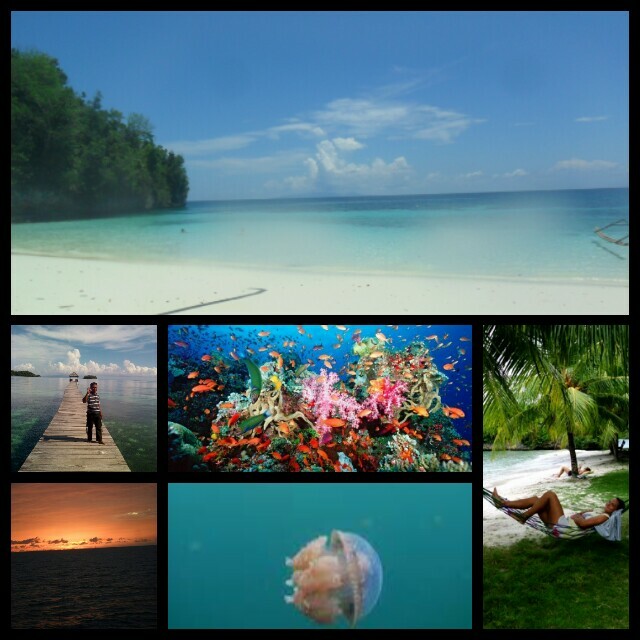 TOGEAN ISLANDS & PULOCINTA (Love Islands) & Whale Shark..,Tour Package 6 Days 5 Nights. TOGIAN ISLANDS.togean islands is the formation island in the gulf of tomini, inside on wallace line, save the unique biodiversity, ,marine life unferwater,relaxing athmosfer,unique marine society. Gorontalo is the ancient Volcanic ring site,the presure process of old volcanic million years ago,limboto lake kaldera and geothermal hotsprings made the relic and track of big tekto-volcanic process in Gorontalo area,lava island in the north gorontalo is the site track of earth geology story long time ago.Gorontalo located have on Northern Sulawesi (beetween central sulawesi and north sulawesi)Pulocinta Islands (Gorontalo) have 123 tropical island,coral reef in gorontalo more varioust species, concentrate,healty and impresif,south gorontalo position inside in the gulf of tomini and north gorontalo in the sulawesi sea.Wall and deep is the topografi of marine reserve in gorontalo,morfologi and topografi of the sea in Gorontalo make the good ecosystem for giant fish exist and stay in gorontalo sea,Whale shark,orca,pilot whale and mola mola is one of the most animal in Gorontalo sea.is the house of varioust marine diversity. many long sandy beach in the island of Gorontalo,quoite and still pure nature.In Gorontalo have the biggest national park in sulawesi,bogani naniwartabone and Nantu forest reserve and Paguyaman forest is the protected wild jungle in Gorontalo. The rainforest in gorontalo is the house of diversity flora and endemic animal of Sulawesi,like babirusa,black macaca (sulawesi apes),tarsier and Sulawesi bird. 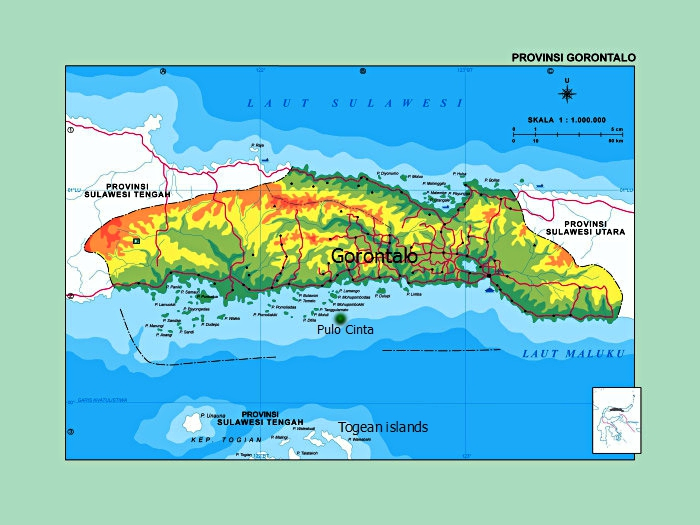 Gorontalo inside on the wallace line area and equator line. Gorontalo collect many beautifull waterfal,river and mountain, still exist the jungle tribe in jungle on gorontalo,Polahi tribe is the jungle comunity in gorontalo,they still life primitive. gorontalo society culture still mytologys and animism faith,combine with sufism of islam. Pick up transport from airport of Gorontalo or from Hotel, go to Boalemo Beach Resort , 1,5 hours on the road. 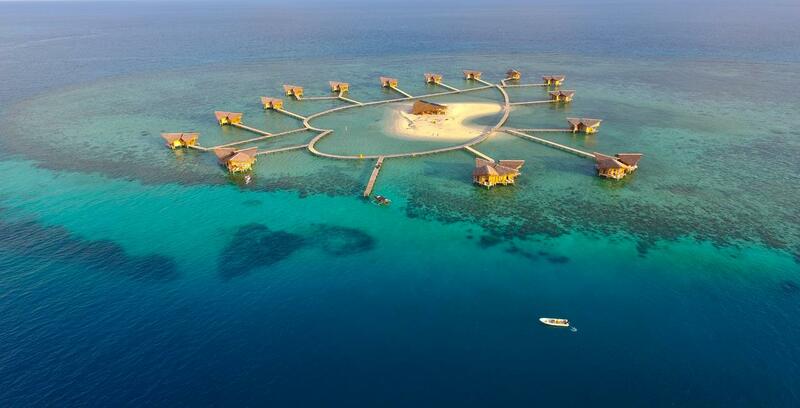 check in Resort, breakfast or lunch, after that go islands hoping trip, visit the water villa in Pulocinta island,explore the island, sigthseeng the water villa wood, after that snorkling on the coral reef on pulocinta islands, beautifull marine reserve and many fish. after that go to Rahasia island (secret island), this island is a sandy island and coral reef and empty,relaxing on the beach and snorkling…afternoon back to resort, sunset program..dinner, watch the milky way starr. morning,varioust bird sound,Breakfast, 09:00 go to bajo gipsy sea (bajau tribe) village,walking on the long bridge and seeghtsing local culture on gipsy sea village, after, go snorkling to hotel california marine Reserve, beautifull marine park, varioust species of fish and varioust coral,after that go to Karina beach,lunch on the beach,relaxing on the beach or swiming, is beautifull beach,ampty beach, after that go to jellyfish lake, snorkling with stingless jelyfish, afternoon back to resort, sunset program,dinner, rest..
morning,varioust bird sound,Breakfast, relaxing beach,09:00 snorkling in Reef number five and Reef number 4, after that finding dolphin, lunch on the unnamed beach, afternoon go to malenge jungle,watch the horbill bird and black macaca, back to resort, sunset program. breakfast, 06:00 pick up to dolong haarbour, 08:00 of clock cross back to Marisa Gorontalo, 5 hours with the ferry boat. arrive in Marisa gorontalo at 14:00 of clock, pick up to Gorontalo bay, 3 hours on the road, beautifull landscape on the roat, green mountain and tropic cooconut plantation view road. DAY 06 – Whale shark Marine Reserve (Gorontalo Bay). breakfast,07:00 go to Whale shark marine reserve, snorkling with Whale shark..(giant fish), we not guaranted the whale on the park, if the sesion the fish everyday stay on the marine park, if not the sesion sometime he go far from the located, we must find on many area in Gorontalo bay. (connect flight return is the afternoon flight). -standard room hotel in Gorontalo bay. -boat trip and boat transport,private car transport,petrol,driver boat. -local tour guide and guide snorkling,ranger, (english speak). in togean islands, the accomodation and room resort limited on the island, please register/booking tour 1 months before arrive.